Recently I came across this photo of myself. 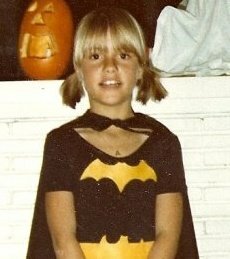 What ever happened to Batgirl? I thought, as though she were the girl who sat behind me in pre-algebra. Somehow we lost touch along the way. She didn't mind wearing a cape or being photographed. She didn't worry what her thighs looked like in the tights or even really care what others thought. But it's more than that. There's a "hello, life!" look in her eyes that I want back. She just knew what she wanted to be. Or who she was. Recently I've had the occasion to need a more formal bio photo. The people who asked for it gave me a deadline of the end of August and, while I kept intending to get it done, I was really more in summer mode. You know: procrastination + que sera, sera attitude. Plus denial. Finally, at the end of the month, I put my camera in Maddy's hands, stood in the spot of our house with the best natural light, and said "have at it!" It was after a Sunday nap and I forgot to brush my hair. That's how bad I am at being a photo subject. I did put in earrings, however. although I would have been just as happy to send in the batgirl photo and call it done. Sam got a Wii for his birthday in August, which means we are all enjoying his birthday bounty. One day he asked if he could do a Mii of me (which is a character that you create and can have as your avatar when you play a game). It was hilarious to see him decide on the nose and the hair and the eyebrows and the size. He made me thinner and better looking than I really am, which was very kind of him. Or maybe that's how he really sees me? Making me think: if the people I love think I look fine, maybe I should stop worrying and get on with things. I think that's what Batgirl would do. p.s. I'm back. I think. I'm dipping my toe back in the waters of everyday life, after a great visit from my mom (she left today + I'll be posting some of our adventures for record-keeping sake) and our family's August journeys. Bless you, September, with your routines and nesting. I'm looking forward to both. September 10, 2009 by Anne.